We’d love your help. Let us know what’s wrong with this preview of Apex Five by Sarah Katz. In recent years, the nation of Tabira has employed remarkably advanced technology to subjugate the entire Plane and eradicate all belief in the Zaam. Now, the three remaining nations must uncover the secret behind Tabira's sudden forward leap in civilization. At the fore For millennia, the people of the Plane have worshipped five megaliths as relics of the mysterious Zaam. To ask other readers questions about Apex Five, please sign up. Sarah Katz opens her Apex Five fantasy/sci-fi series in kaleidoscopic splendor. The Plane, Book One is delightful and intriguing, leaving one hungry for the books to follow. After a brief peek at an ancient cataclysm, The Plane opens in a fictional world where five societies, Tabira, Lir, Garo, Ayam, and an extinct polity known as the Opal nation, comprise a cultural and political tapestry of overlapping history and ancestry. Glowing and mysterious megaliths from a lost civilization tower over and haunt the story in each of the countries, telling of ancient origins and foreboding possibilities for the future. Though it takes place on one planet, the story initially reminded me in some ways of the Dune saga, due to the rich and complex political history. However, unlike in Dune, which opens with a numbingly long history lecture, Katz does a skillful job of layering in the history as she tells an entertaining story. The reader’s perspective broadens and deepens as the character interactions unfold, yielding both an engaging real-time drama and a narrative context which, by the story’s end, is epic in scale. While told in a light and at times playful tone, the tale interweaves profound themes. A dominant government exploits historic enmities to pit subordinate political and cultural bodies against one another to quell revolt. Countries with a common religious faith war with one another over resources and control within an oppressive political structure that seeks to divest them of their beliefs. Matriarchal and patriarchal cultures, disparities in education and access to technology, and undercurrents of illicit drug trade and addiction add complexity to the mix, painting a lifelike portrait of conflict among interconnected societies. Katz lays out a fascinating and unusual juxtaposition of technological modernity and ancient faith, with a sophisticated exploration of colliding and incomplete notions of “enlightenment.” She manages to paint portraits of villainy and heroism without falling into the error of creating monolithic characters. The personages in her story have understandable motives within the context of their place in the cultural and historical matrix. Bravery and cruelty issue from all sides, resulting from the actors’ overconfidence in the completeness of their world views. Neither the technologically advanced nor the religiously devout truly understand the origin of their forms of wisdom, and their disparagement of each other yields chaos borne of ignorance. There are also hints of abuse and betrayals of sacred trust, on tender and grand scales. Lest this sound too heavy, please let me emphasize that the story is fun and fast-paced. It includes exotic creatures, such as an enigmatic and very important fellow who draws his sustenance from the sun, a race of humans with wings and feathers descended from people who could fly, and a class of revered Lirians called the Lasha who regularly and naturally change gender from time to time, with interestingly complicated results. Katz’s story touches on points of tension within our own culture, but within the fictional context she avoids their fraught nature and bathes them in light. This story is deceptively simple on its surface, and I what I found most impressive about it is that Katz deploys her intelligence and depth with such agility and grace. This is a splendid read and I want to know what happens next. A very interesting story and setting. I'm sure it's not for everyone: the language used is sometimes a bit alienating. To me, it felt a bit like I was a kid again trying to wrap my head around the Jack Vance books of my father. It's worth reading every bit, though. Maybe that's a good comparison? Jack Vance meets Yoko Tsuno. First, let me preface this review by saying that I am not a huge fan of sci-fi. I read Apex Five because I wanted to branch out from my usual reading preferences and I wanted to support an independent author. Katz’ writing is excellent, truly poetic and at times utterly beautiful. I found her attention to detail and her world-building amazing. The world she created in this novel is profoundly complex and rich with its own history, and without her writing skills, I would have found myself lost in First, let me preface this review by saying that I am not a huge fan of sci-fi. I read Apex Five because I wanted to branch out from my usual reading preferences and I wanted to support an independent author. Katz’ writing is excellent, truly poetic and at times utterly beautiful. I found her attention to detail and her world-building amazing. The world she created in this novel is profoundly complex and rich with its own history, and without her writing skills, I would have found myself lost in a sea of words. The characters are well-developed and their dialogue is realistic. The entire world Katz has created is filled with such unrest, it kept me captivated throughout. Often times, I could see this story as a Blockbuster film. If you’re a sci-fi fan but want something with a little more depth and meaning, then Apex Five won’t disappoint. Mystery, good banter, great story and concept, sci fi from an author that understands and loves technology. I have visited many different worlds and universes through reading, but only a few expand my imagination and leave me wondering and wanting to set foot in those worlds, see more, experience the corners I didn't get to see, learn about the culture and people. Lacking access to a proper keyboard, this is just going to be a short placeholder until I'm able to write a full review. 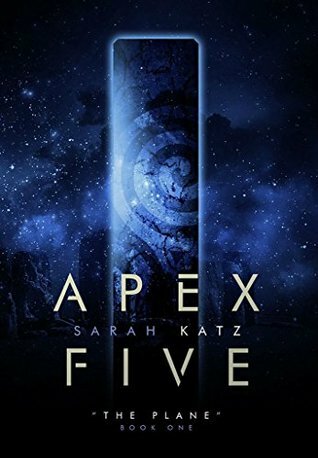 Apex Five is a refreshingly original novel by indie author Sarah Katz. Boasting a politically-fueled storyline and some memorable characters/alien races, this is a book I won't be forgetting soon. There were a few very minor qualms I had with some of the POV transitioning, which is the only reason this didn't get the full 5 stars. Still, coming from such a small publishing hous Lacking access to a proper keyboard, this is just going to be a short placeholder until I'm able to write a full review. Apex Five is a refreshingly original novel by indie author Sarah Katz. Boasting a politically-fueled storyline and some memorable characters/alien races, this is a book I won't be forgetting soon. There were a few very minor qualms I had with some of the POV transitioning, which is the only reason this didn't get the full 5 stars. Still, coming from such a small publishing house, this book is incredibly written and HIGHLY recommended. I can't wait for Ms. Katz to get the recognition she deserves. Sarah’s novel is highly recommend and she sheds light through her work via her characters and the world she’s created. You can easily visualize this as a series playing in your mind. If you love reading good science fiction and drama, I highly recommend! Sarah supplements the creativity of sci-fi with the quirk of satire. Outside of writing, she works in cyber security, enjoys traveling and occasionally gets lost out in nature or on Wikipedia.